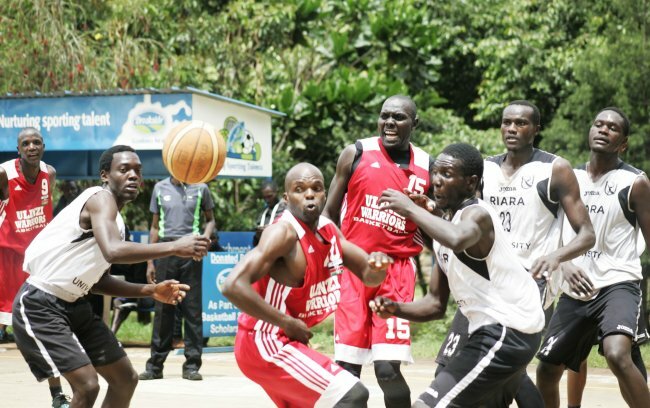 Ulinzi face Kenya Ports Authority in a Kenya Basketball Federation men's Premier League match to determine which team proceeds to the play-off. Last weekend, KPA led 41-31 at half time before beating USIU-A Tigers 84-62 in Mombasa. Victor Okello scored 23 points for KPA and Alex Ramzan replied with 20 for the students. The women's team warmmed up for their continetal challenge by beating USIU-A Flames 80-30 last Saturday. They comfotably led 33-9 at half time. Blandine Ndaya and Georgia Odhiambo scores 14 and 10 points for KPA while Linsay Wanyonyi had nine for USIU-A Flames. On Sunday, KPA overran Stormers 75-44 after leading 27-14 at halftime. Ndaya scored 14 points and Felmas Adhiambo 17 for KPA. Sly Omollo replied with 13 points for Storms while Angela Luchivya had seven. In the second match playoffs this weekend World Hope have a chance to level the scores after losing 58-63 to Nakuru Club in Nakuru last weekend. Trailblazers who narrowly beat Mt. Kenya University, Thika 62-57 at Strathmore University could make it two wins. In the first match Eugene Genta scored 18 points for Trailblazers and Joshua Paniel 11 for the students. Lakeside who beat Kenyatta University Pirates 57-39 in Nairobi last weekend are gunning for a second win at home. Last Saturday, they led 25-16 at half time. Isaiah Kiyaka scored 15 points for Lakeside and Brian Ondiek 10 for Kenyatta University Pirates. Saturday, November 11, 2017: Lakeside v Kenyatta University Pirates (Game two - 8.30 a.m. in Kisumu); Mt. Kenya University, Thika v Trail Blazers (Game two - 8.30 a.m/. ), Strathmore University v Africa Nazarene University (Game two - 10 a.m.), Ulinzi v KPA (League - 3 p.m.) - at Strathmore University. Sunday, November 11, 2017: Co-Operative Bank v Zetech (Game one, 8.30 a.m.), World Hope v Nakuru (Game two, 10 a.m.), Strathmore University Blades v USIU-A Tigers (Game one, 11.30 a.m.), Co-Operative Bank v Umoja (Game one, 1 p.m.), Thunder/Equity v KPA (Game one, 2.30 p.m.), Ulinzi v Thunder/Equity (Game one, 4 p.m.). November 4, 2017: KPA 80 USIU-A 30, KPA 84 USIU-A Tigers 62 (in Mombasa), World Hope 58 Nakuru Club 63 (in Nakuru), Barclays 90 Eldonets 72 (in Eldoret), KDF Morans 59 Riara 47, Trailblazers 62 Mt. Kenya University, Thika 57, JKUAT 47 Little Prince 53, Kenyatta University Pirates 39 Lakeside 57, Africa Nazarene University 41 JKUAT 40, Footprints 54 Daystar University 43. November 5, 2017: KPA 75 Storms 44 (in Mombasa), Daystar University 36 Footprints 37, JKUAT 65 Africa Nazarene University 73, Little Prince 59 JKUAT 52, Riara 37 KDF Morans 41.